Measure the width of your curtain track - write this measurement into the 'track width' section on the order form. If you are measuring for a new track, we recommend that you add 20cm to both sides of the window measurement to allow for the curtains to be stacked back - leaving the window clear, when curtains are opened. To measure for the curtain drop, measure from the top of the track to the point where the curtains will end. Write this measurement into the â€˜curtain length' section on the order form. For the length/drop the curtain will be made to the nearest centimetre. 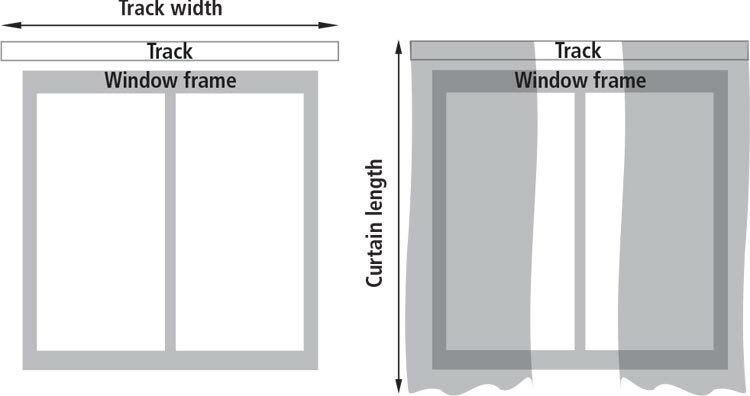 For the width, the curtain will be made to fit the band of measurements indicated, not the exact width of your track. This is to allow for gathers in the fabric so it sits nicely on the window. Many curtain specialists can assist with measuring, and installing your curtains or roman blinds. Find your nearest Resene curtain stockist . Your roman blind can either fit inside the window frame – inside mount - or be the same width to cover the window – outside mount. Outside mount will give you the better thermal properties and help to block out more light. Inside mount may be preferred where there is limited space and there may be obstructions for an outside mount. Width: To cover the window frame, measure from the outside left edge of the window frame to the outside right edge of the window frame at the top, middle and bottom of the window. Use the largest measurement. Add 100mm to your width measurement so your blind sits 50mm either side of the window frame. If there are objects close to the window that would block the blind, adjust the width as needed. Height: To cover the window frame, measure from the outside top edge of the window frame to the outside bottom edge of the window frame on the left, middle and right hand sides. Use the largest measurement. 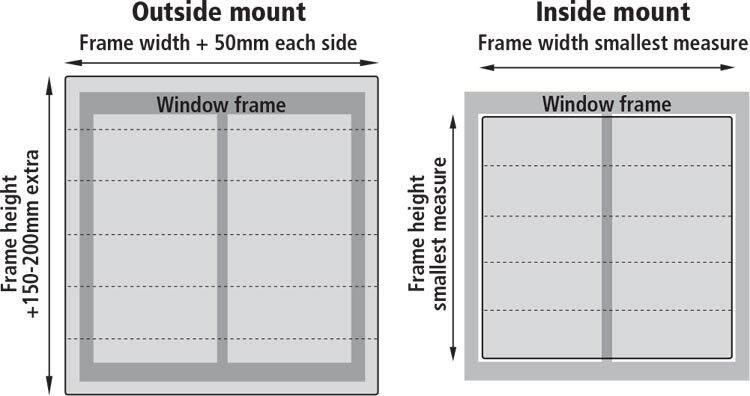 Add 150-200mm to your frame height measurement so your blind sits off the window when open. If there are objects close to the window that would block the blind, adjust the height as needed. Width: To fit inside the window frame, measure the inside of your window from one side to the other at the top, middle and bottom of the window. Use the smallest measurement. Height: Measure from the top to bottom of the inside of your window frame on the left, middle and right hand sides. Use the smallest measurement.